There are two types of human on earth, Aware and Non-Aware. Aware are those who do not become victim of AGFLAP, remain synchronized with Universe and maintain certain harmony with Earth. Non-Aware humans are those who love Mind-Based and Emotion-Based drama. They consider them as their objective of life (in fact consider them as LIFE). Actually they are unable to decide certain Target for themselves beyond this realm. There is another element which differentiates between aware and non-aware human being and that is ATTACHMENTS. 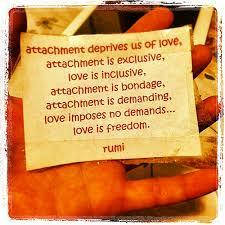 Attachment stands for development of certain security by associating with certain human or thing. People proudly say that they are strongly attached to their mother, father, pet, room, car, institution or materialistic things . They are so involved in their attachments that they feel that it would be impossible for them to live without those people or things to which they share this bond. Hence, the existence of those people and objects give them FALSE SECURITY. These people think that as far as their favorite people or objects are around, THEY ARE SECURE. However, humans are capable of deception and objects are likely to break or disappear. It means that this SENSE of SECURITY is such shallow that it cannot be guaranteed forever. Those who live in such securities are unable to imagine their life beyond their ATTACHMENTS. They feel that there is nothing beyond their ATTACHMENTS. This thought prevents them to go out and explore the world. They are unable to accept the actual realities and mostly spend their life for false values and principles. Breaking Attachment means being Isolated? Breaking ATTACHMENTS is nothing to do with being ISOLATED. Rather, it empowers the human to live INDEPENDENT life,which makes him VALUES everything but without attachments. When these attachments break, human suddenly realize that HE HAS WASTED ALL HIS LIFE FOR THOSE THINGS WHICH DID NOT MATTER AT ALL. Thus, in order to avoid such dilemma and to live independent and an empowered life, human must break his ATTACHMENTS with his SURROUNDINGS but integrate VALUE AND APPRECIATION for them.